Australia’s Great Barrier Reef suffered a “catastrophic die-off” of coral during an extended heatwave in 2016, threatening a broader range of reef life than previously feared, a report revealed Thursday. Scientists said some 30% of the reef’s coral died in the heatwave from March to November 2016, the first of an unprecedented two successive years of coral bleaching along the 2,300-kilometre World Heritage-listed reef off Australia’s northeastern coast. The study published Thursday in the journal Nature found that coral, which serves as habitats for other creatures, were particularly hard hit by the rising sea temperatures caused by global warming. Terry Hughes, a report co-author and head of the Centre of Excellence for Coral Reef Studies at Australia’s James Cook University, told AFP the most susceptible to heat exposure were branching corals — table-shaped creatures that provide nooks and crannies for fish nurseries and fisheries. Corals that were more likely to survive the warmer sea temperatures were smooth and melon-shaped, he said. While they were good calcifiers that add volume to reefs, they were “not very useful as habitable providers”. “So there is a shift in the mix of species and the overall loss of corals has a broader impact on all the creatures that depend on the corals for food and habitats,” Hughes said. His research centre said the new study showed that corals on the northern Great Barrier Reef “experienced a catastrophic die-off” following the 2016 heatwave. “The coral die-off has caused radical changes in the mix of coral species on hundreds of individual reefs, where mature and diverse reef communities are being transformed into more degraded systems, with just a few tough species remaining,” said Andrew Baird, another of the report’s authors. “They are the ones that are going to refeed and repopulate an altered reef into the future,” Hughes said, adding that one way to maintain their health was through improving water quality by reducing coastal pollution. 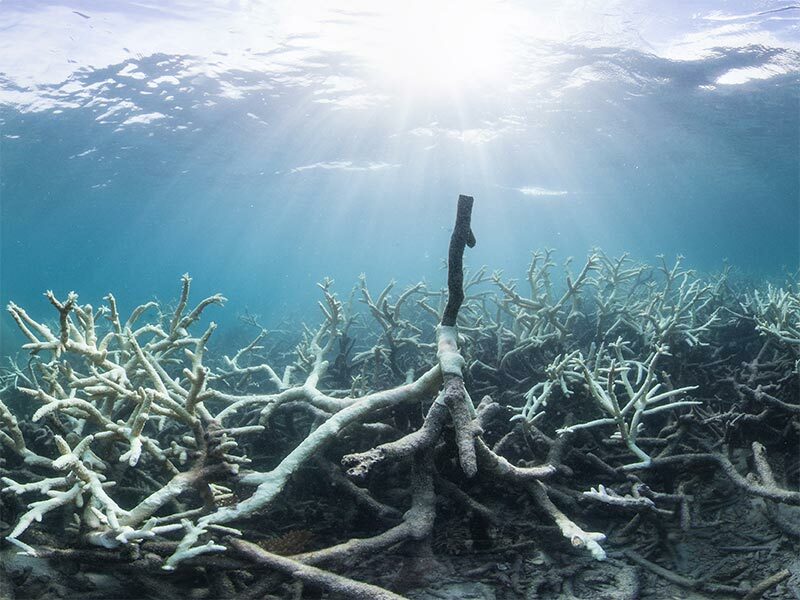 “We’ve now seen four bleaching events (1998, 2002, 2016 and 2017) on the Great Barrier Reef with one degree (Celsius) of global average warming,” he said. “We are on a pathway where we are committed to a different Barrier Reef. Coral reefs make up less than 1% of Earth’s marine environment, but are home to an estimated 25% of ocean life, acting as nurseries for many species of fish. The day you laid your hands on me (back in 1999), human civilization entered a trajectory of great death and destruction and eventual species extinction. It was the biggest mistake you made, by far. You DO NOT lay your hands and prosecute the Messenger of the Covenant for this generation. You do, and you pay the price. You are NOW paying the price for your actions. Thus said, I AM here to offer you and your house the opportunity to REPENT of your SIN and come clean with the Creator in Heaven. Here is what is REQUIRED: the arrest, prosecution and incarceration of ALL those who have come against me since 1999. I want the military industrial intelligence security complex dismantled and destroyed. War is obselete now. I want every single spy and surveillance camera installed at our colleges and universities, in our libraries, in our businesses and on our street corners etc… dismantled, destroyed and outlawed. You will pursue a path of Global Environmental Order and the pursuance of a GLOBAL MARSHALL PLAN for Humanity: http://leftcoast77.simplesite.com It is time to evolve our civilization from a lowly type 0 to a type 1 advanced civilization on planet Earth. Its time to INVEST some serious funds into the construction of a sustainable world order that can survive the 21st century. The current trajectory you are now on WILL end in absolute and complete utter destruction for all life on Earth if you DO NOT turn from your evil ways and begin to pursue the path of peace, prosperity and species survival.